Set of 4 custom V-routed HDU clocks. We created a 3-D routing file to make the custom moldings for the border. The clocks have genuine 23k gold leaf to give them years of durability and a look like no other. 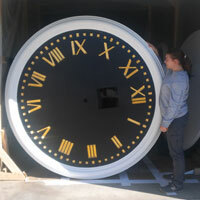 We finished the clocks with 1 Shot paints and installed mounting hardware in the backs for easy installation.